OpenKM is a powerful and easy-to-implement enterprise electronic document and record management software that enables businesses to efficiently and systematically capture, store, manage, secure, maintain, and distribute corporate information assets with the goal of facilitating knowledge creation, optimizing business processes, and improving decision-making. OpenKM integrates features and tools for document, record, knowledge, and enterprise content management into one single easy-to-use solution. It allows users to collect information and content from digital sources and capitalize on them through advanced search. The system, furthermore, is equipped with administration tools and access control features which permit them to define various roles within their organization and set rules and policies the determine how each document or record should be managed. The document and record management system also includes workflow monitoring and management capabilities that help users accelerate the way they share and exchange information and content associated with their transactions and business processes, and track the tasks and activities of every person involved in such processes. The ability to capture unstructured information from any digital source is among the valuable and efficient features available in OpenKM. When we speak of a digital source, this refers to any resource in a digitized form which can be read and scanned electronically. Examples of digital sources are document collections that are converted into machine-readable form for online access, scanned text images, databases accessible online, storage devices, digital audio and video clips, and more. The collected information is then stored in a single workspace where users can access, view, and edit it, providing a highly valuable repository of corporate information assets accessible from a single application. Users will be able to have full control over all the information captured by the software. They can use the information to modify and enrich the documents they are distributing throughout their organization or team. 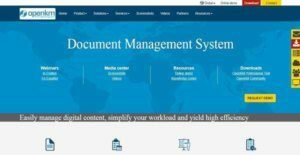 The electronic document and record management software makes it much easier for users to collaborate with their coworkers and colleagues. They will be able to easily find and share the information, content, and documents that others need so they can perform their tasks, resolve issues, complete projects, and make decisions faster. Version control features are also present in OpenKM, making it an integrated version control solution. Team members can check in and check out document revisions using a standardized model. As they review or modify documents, they can also add annotations or comments. If they want to view and access the previous versions of a document and restore them, the software allows them to do that with ease. In OpenKM, document, content, and knowledge creation and management are all linked with workflows and processes. This means as users engage in transactions and perform their tasks based on their roles, the software makes sure that all the documents they need are stored and organized in such a way that it meets the needs and requirements of their workflows. To be able to do this, the software comes with a built-in workflow engine which enables users to build intricate workflows based on business logic. This engine supports the creation of both simple and complex workflows, including serial and parallel workflows. Serial workflows are processes wherein one action or activity must be completed first before one is able to move to the next action or activity. When it comes to parallel workflows, these are comprised of actions and activities that can be performed all at the same time. Users can create specific workflows for reviewing, approving, and validating documents. OpenKM has a set of features that are exclusively designed for records management. For instance, it has a feature called OpenKM Disposition which permits users to perform processes related to maintaining or destroying records, or transferring decisions that are documented in disposition authorities and other instruments. Another records management feature is the Open File Plan. This feature permits users to set and enforce rules for each type of record being accessed and managed within their organization. Here, they will be able to specify where records must be retained, how long they must be retained, who must be in charge with the management of such records, and how the records should be destroyed or disposed of. If you are interested in OpenKM it could also be a good idea to check out other subcategories of Best Version Control Systems collected in our database of SaaS software reviews. Organizations have unique needs and requirements and no software application can be just right in such a situation. It is pointless to try to find an ideal out-of-the-box software system that meets all your business requirements. The smart thing to do would be to customize the solution for your special requirements, employee skill levels, budget, and other factors. For these reasons, do not hasten and invest in well-publicized leading solutions. Though these may be widely used, they may not be the best fit for your unique requirements. Do your homework, look into each short-listed platform in detail, read a few OpenKM reviews, contact the maker for clarifications, and finally choose the application that presents what you require. How Much Does OpenKM Cost? OpenKM is available in three editions: Professional, Cloud, and Community. The Community Edition is available to open source community and redistributed under the terms, conditions, and premises specified in the GNU General Public License version 2. This is a free software license which permits you to run, study, share, and modify the software for free without worrying about any enterprise pricing fees. The pricing for the Professional and Cloud editions, however, are not publicly disclosed, so you need to contact the vendor and request for a quote. We realize that when you make a decision to buy Version Control Systems it’s important not only to see how experts evaluate it in their reviews, but also to find out if the real people and companies that buy it are actually satisfied with the product. That’s why we’ve created our behavior-based Customer Satisfaction Algorithm™ that gathers customer reviews, comments and OpenKM reviews across a wide range of social media sites. The data is then presented in an easy to digest form showing how many people had positive and negative experience with OpenKM. With that information at hand you should be equipped to make an informed buying decision that you won’t regret. What are OpenKM pricing details? What integrations are available for OpenKM?